Took a drive to Hillsboro a couple of days ago to see a guy about a lawnmower. This is what we found: Red clover fields surrounding his entire farm on Minter Bridge Road. Stunning! Took this with my iPhone; post in Topaz Adjust sliding my own sliders after trying every preset and thinking I could keep track of what I liked better if I got behind the wheel myself. Decided to go for a painter-like look, pushing the contrast and strengthening the red/green complimentary colors. 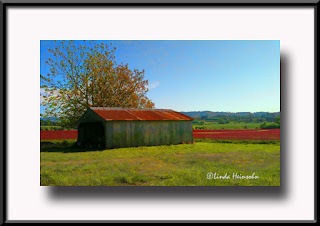 I especially liked how the discoloration on the metal shed turned into watercolors and how the rusty roof punched up to be very similar in color to the clover. Stepping back, the photo turns into three basic color bands--green, red, blue. Cool! Great job on the painterly version of "Red Clover fields" I really like the results. The side of the barn seems to be reflecting the colors in the grass. Very cool!